With graduation fast approaching, we’re taking the month of April to honor our M&T Class of 2015 with a few Senior Spotlights. This installment comes to us from Joe Strege about his favorite activities at Penn. Outside of the world-class academic opportunity that the M&T Program provides, the social and extracurricular activities that one can find at Penn have made my four years here truly special. The two groups that I am primarily involved in are my fraternity and the Penn Club Baseball team. These groups have helped me find a community of individuals with similar interests to me and has helped make the campus more intimate. When I came to college, I knew that I wanted to be a part of Greek life from day one. My father and brother were both in fraternities at their schools and their best friends to this day were members of their respective fraternities. Penn has a very vibrant Greek scene for anyone that is interested, with over 20 fraternities and 9 sororities on campus. The fraternity’s most important function is that I was able to make a large group of friends that have helped make my four years here an incredibly fun and positive experience. However, I have gotten far more out of the organization than just a group of friends. I served as scholarship chairman, treasurer, and recruitment chairman my sophomore, junior, and senior years, respectively. In these positions, I have learned many important lessons regarding people management, money management, and event planning. Additionally, the fraternity has provided me the opportunities to acquire life, academic, and career advice from older members, as well as the chance to mentor younger members who are going through the same experiences I had as a younger student. After being a three-sport athlete in high school, it was hard to walk away from organized sports when I came to college. Luckily, I found the Penn Club Baseball team on Locust Walk my freshman year and have been involved with the team ever since. Being involved with Penn Club Baseball has been a great experience for me because it has allowed me to continue to play the sport that I love without being an overbearing commitment. We practice twice per week and play around 15-20 games per year, so there is ample opportunity to play. Yet, if I am having a really rough week with school or have other commitments, I am able to skip practice with no real repercussions, unlike with a varsity team. At the end of the day though, it is the people that are involved in PCB that make it such a great experience. I highly suggest athletes that come to Penn to get involved with a club team, as the school offers club teams for just about every sport. Joe, originally from Saint Louis, Missouri, is a member of the M&T Class of 2015. 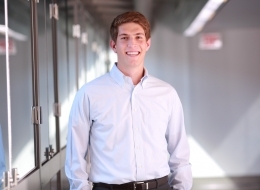 He studies Electrical Engineering within Penn Engineering and Finance in the Wharton School.